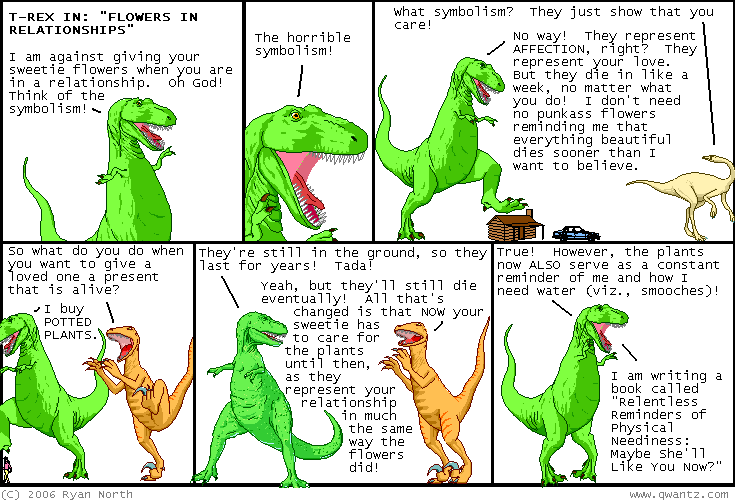 Dinosaur Comics - April 25th, 2006 - awesome fun times! –Hooray for fun science facts! April 25th, 2006: RSSPECT (the site I wrote that makes creating RSS feeds easy) has been getting a lot of use, but I'd noticed that many people wanted to create RSS feeds for sites they didn't control, like for instance, the list of corrections to CBC news stories. So, I added a new type of RSS feed to the site today, that lets you create feeds for such sites. Now you can use RSSPECT to create an RSS feed for almost every single website (or document) on the internet! Pretty sweet. I hope you find this useful! One year ago today: post-pubescent!